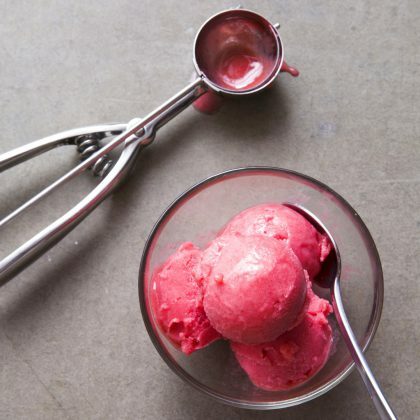 Raspberry sorbet is refreshing_but it’s often too icy to be worth eating. For smooth scoops, we froze a small portion of the base separately, adding it back to the rest before churning. Because this small amount froze so rapidly, there wasn’t enough time for large ice crystals to grow; mixing this super-chilled mixture into the larger base encouraged the growth of similarly small crystals, for a fine-textured result. We also added pectin in addition to the berries’ natural amount to give the sorbet stability in and out of the freezer. If using a canister-style ice cream machine, be sure to freeze the empty canister for at least 24 hours and preferably 48 hours before churning.